ARM scanners feature a series of patented and exclusive characteristics that have been received with admiration and laudatory comments from the most prominent physicists, such as modular construction and synchronic lifting movement that allows for real isocentric scanning. These features are the result of exclusive radiation scanning devices development and design for more than 20 years. 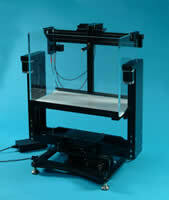 ARM M3000-ISO: based on ARM modular system, an all purpose scanner that allows scanning either in isocentric mode or conventional mode (SAD & SSD); requires only a fraction of volume of water than conventional scanners, does not require the use of lift tables and because of its modular design, allows for in-site building, using only the required modules during a particular procedure, and can be purchased gradually starting with the basic modules for basic procedures. Field Sizes up to 40 x 40 cm. Movements: X, Z axes, lifting, rotary and auto-center. ARM M3000-RS: STEREOTACTIC BEAMS ONLY. A scanner with a tank that requires only 3 gallons of water, is able to perform SAD and SSD scanning. Max Field Size is 60 mm. Movement in X, Y, Z axes and lifting. ARM 1000-CAL: (A subset of M3000-RS) Only depth measurements; scans PDD and TPR. 1D Calibration only (points). Movements: Z, lift. Call us for details. We recognize the overwhelming superiority of the ERROR FREE SAD scanning, but the current methods of data validation for Treatment Planning also requires SSD data. A different matter is for the stereotactic beam scanning, where the SAD scanning is an absolute requirement. ARM Inc. offers both modalities in one scanning system.